The original building on the site was built in 1898. That building was destroyed by fire in 1901 after being struck by lightning, and the current building was built on its foundation. What is on the other floors? The building is owned by Dallas County, which occupies the first five floors. The Museum operates on the sixth and seventh floors through a lease with Dallas County. Are any of the windows on the sixth and seventh floors original? It is unclear if any of the current windows date from 1901, but some of them may have been in place in 1963. What happened to the original entrance sign? The enameled metal sign that was mounted above the main entrance to the Texas School Book Depository building is part of the permanent collection of The Sixth Floor Museum. It can be viewed online here. What does the National Historic Landmark designation mean? 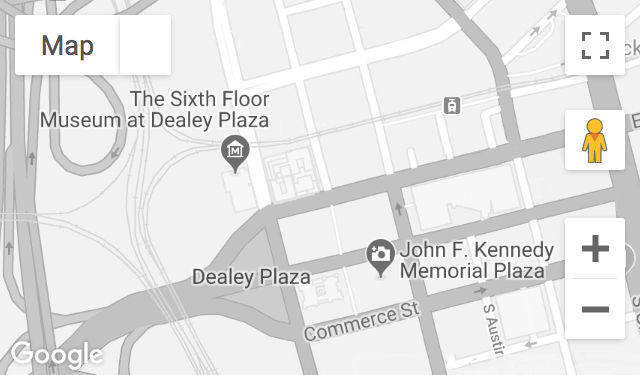 The landmark designation by the federal government recognizes that Dealey Plaza has outstanding significance to the history of the United States. The site was designated because the course of American history changed here when President John F. Kennedy was assassinated on November 22, 1963. The Secretary of the Interior signed the official designation on October 12, 1993, and a landmark dedication ceremony was held in Dealey Plaza on November 22, 1993, on the 30th anniversary of the assassination. Today just over 2,500 sites are recognized as National Historic Landmarks by the National Park Service. The Texas School Book Depository Building was previously recognized as a Recorded Texas Historic Landmark by the Texas Historical Commission in 1980. How is the National Historic Landmark designation marked? The Dealey Plaza National Historic Landmark district is marked by a plaque provided by the National Park Service and set flat in the ground on the north side of Elm Street, east of the garden steps and close to the sidewalk. The bronze plaque is mounted on a slab of Texas pink granite. It reads as follows: Dealey Plaza Has Been Designated a National Historic Landmark; This Site Possesses National Significance in Commemorating the History of the United States of America; 1993 National Park Service United States Department of the Interior. What is included in the National Historic Landmark district? The district includes the 3.07-acre Dealey Plaza park, all surrounding buildings facing the plaza, the triple underpass and its bridge, part of the rail yards north of Elm Street and the still standing railroad-switching tower.